There’s some fighting going on. Yue Fei fights a General Han (NOT Han Shi Zhong), who is a Jin general but Song ethnicity. Yue Fei’s troops infiltrate the Jin camp. There’s a lot of fighting going on, which I don’t particularly care about. No one’s life seems to be at stake. Whoops, looks like I spoke too early. 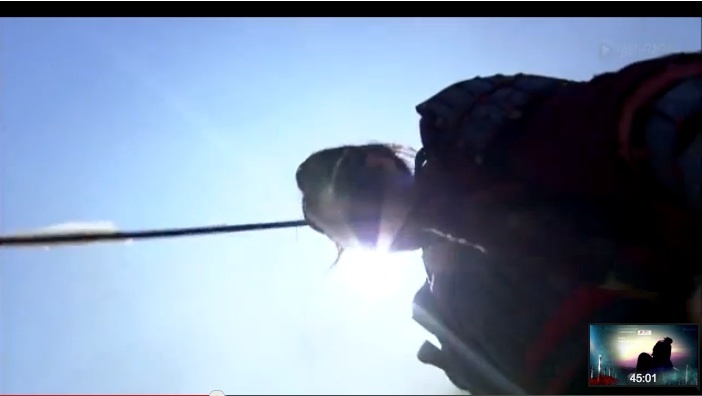 Yue Fei gets shot with an arrow to the chest. But he looks…fine. In fact, he sticks someone in the neck with it and keeps fighting. Then Yue Fei finds a little boy crying in the middle of a bunch of dead bodies. He wipes away the little boy’s tears. With an arm around the boy, he fights off a small group of soldiers. This is totally inappropriate, but I like all the colors in these scenes. 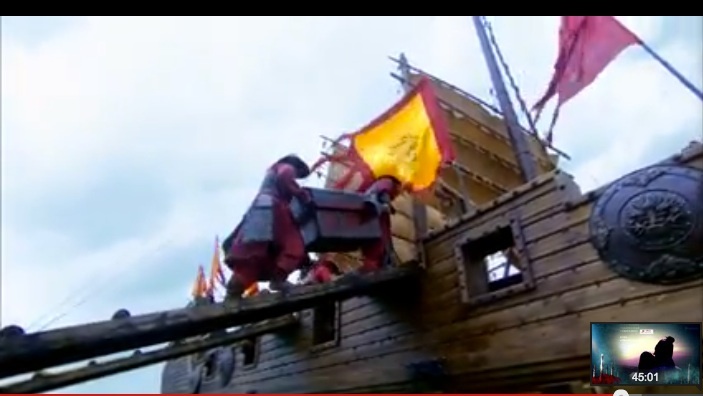 Lots of bright, vivid red (Song army uniforms, flags, and well, blood). 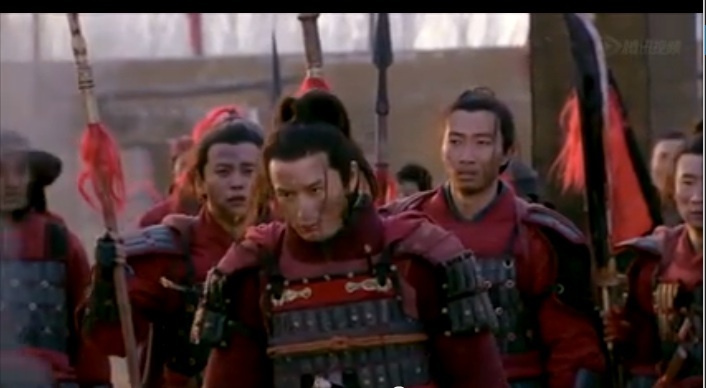 Yue Fei looks around at all the wounded. I think they were protecting the city against attack. When Yue Fei left to attack, Jin snuck up on the Song camp. I can’t make sense of any fighting right now…I’ll blame this on the plot, not my selective fast forwarding. They never tell us why certain places are important. They just film these scenes. Anyways, Yue Fei kneels and admits his mistake to General Wang for causing all these deaths. On the one hand, I think it’s great that Yue Fei’s getting an important lesson. On the other hand, I couldn’t care less right now. There’s no way he’d die right now anyways. 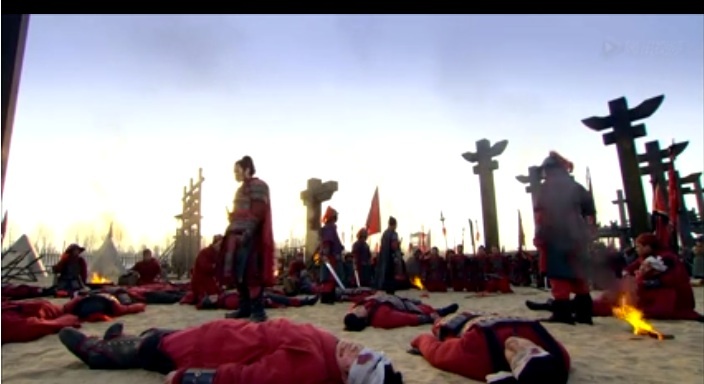 Bro Squad leaps to Yue Fei’s defense when the General orders Yue Fei executed. Honestly. First they try fighting, then everyone drops onto their knees. Finally, to seal the deal, all the citizens run in and cry that Yue Fei cannot be killed. He saved them! 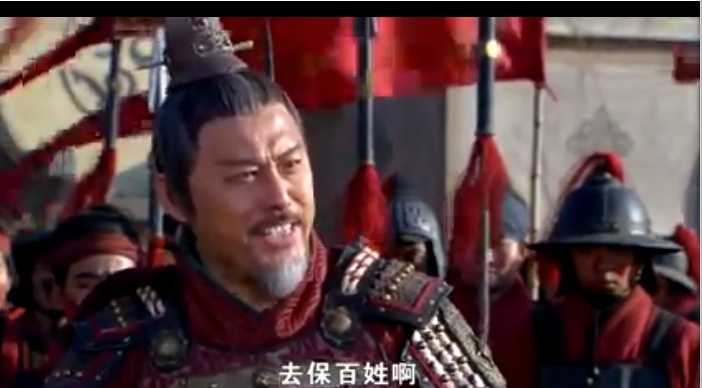 JK, the one who seals the deal is General Zong, who arrives and yells at General Wang. Everyone gets involved in this shouting match and play a blame game. General Zong gets on his knees. Am I the only one who cares that Yue Fei still has two arrows stuck in his chest? Everyone gets on their knees all over again. Sorry General Wang, you didn’t win this popularity contest. Yue Fei gets some harsh punishments, but he gets to live. 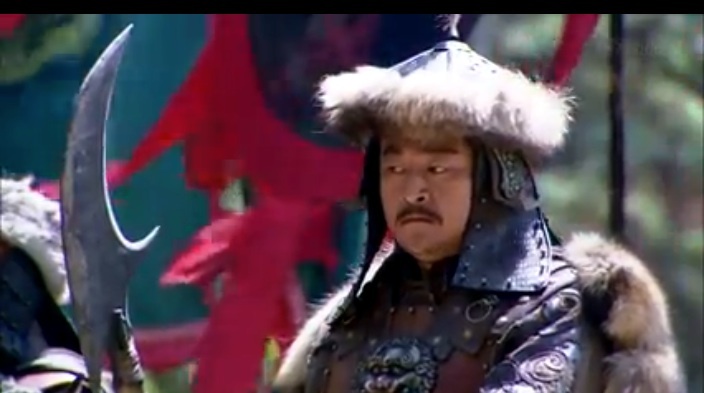 The 1st Jin Prince is sent to war with Song, and he vows to kill Zhao Gou. Meanwhile, Zhao Gou sits in his palace with his fake wife. Jin sends in a box, which contains the head of his real, beloved wife. Zhao Gou completely freaks out. This can’t be good for his mental state. He leaves on a ship. Yue Fei returns to General Zong’s camp. The baddie general wants to work with Yue Fei again. Yue Fei just sits there with his characteristically stoic expression. I’m literally recapping as I watch the episode on split screens. I guess this means I have little patience for useless scenes. Or just little patience in general. I did think it was touching that General Zong got on his knees to beg for Yue Fei’s life. There are so many sayings about how men (and women too, I suppose) aren’t supposed to get on their knees just for anything. Usually only to the ruler, parents, and teachers. In fact, there’s a saying that males have gold underneath their knees, meaning that they should rarely get on those precious knees. So the fact that General Zong dropped down on his knees to a lower ranking, younger General for an even lower ranking Yue Fei was a bit touching. It just shows how much he values Yue Fei. I wish this drama spent a little more time on character backgrounds. Like how Yue Fei’s family is so educated. And how Liang Hong Yu became a soldier with her husband. And how the imposter wife for Zhao Gou suddenly had all the mannerisms of a court lady. This entry was posted in Chinese Dramas, Culture, Drama Recaps/Reviews and tagged 精忠岳飞, Episode 22, Huang Xiao Ming, Jing Zhong Yue Fei, Patriot Yue Fei, Recap. Bookmark the permalink.